Le Reflet des Aiguilles The little mountain village of La Toussuire is part of the inviting skiing area Les Sybelles. There's something here for everyone, from beginners to more advanced skiers. 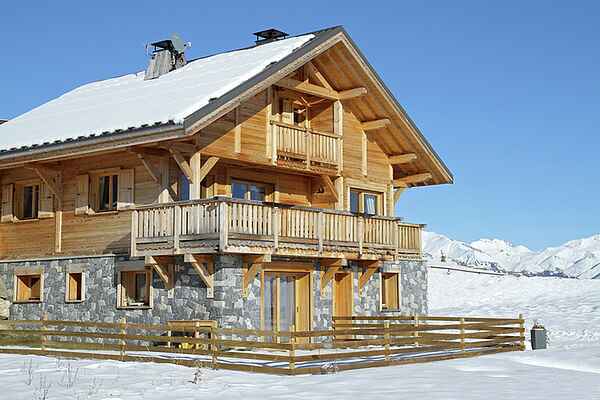 The stylish chalet is situated at the entrance to the village, around 700m away from the piste. There's a stop for the courtesy ski shuttle right outside your chalet. FR-73300-38 This chalet (around 160 sq. metre), which was built in traditional style, features a comfortable interior, a balcony and a 6-person hot tub. It consists of three floors, the top floor is characterised by its sloping roofs. In the living room you'll find a lounge and dining area, a wood-burning stove and flat-screen TV (including home cinema and DVD player). There's a fully equipped kitchen. There are 5 bedrooms in total, each equipped with their own flat-screen TV. Three of the bedrooms are furnished with a double bed (one of which is suitable for disabled people), one of the bedrooms has two bunk beds and an en-suite bathroom with bath and separate toilet and one bedroom has two single beds. There are a further two bathrooms; one with bath and shower and one with shower and toilet (suitable for disabled people). Separate toilet. There's also a laundry room with a washing machine and a dryer, a garage with space for 1 car, two outdoor parking spaces and a storage room for skis which features a heated shoe rack.